So you are wondering why all the buzz about bee pollen, right? Well, aside from boosting your metabolism and suppressing your appetite, you can literally survive on this stuff. Bee pollen contains minerals, proteins, fats and oils, carbohydrates, amino acids, over 5000 enzymes and coenzymes, hormones, peptones, polypeptides and globulins, high concentrations of the nucleic acids RNA and DNA and a variety of antibiotic substances. By providing the human body with all the nutritional elements it needs, and in just the right proportions, honey bee pollen allows the body’s own healing to perform their normal functions of building, restoring and protecting every cell. Not only is it good for boosting energy levels and detoxifying your body, it can be recommended for alcoholism, asthma, health maintenance or stomach problems. Some herbalists recommend this to enhance athletic performance, reduce side effects of chemotherapy and improve asthma. One of our best selling products, INSANE AMP’DTM contains bee pollen. INSANE AMP’DTM is the once a day, all natural, weight loss supplement created to help you safely lose weight. 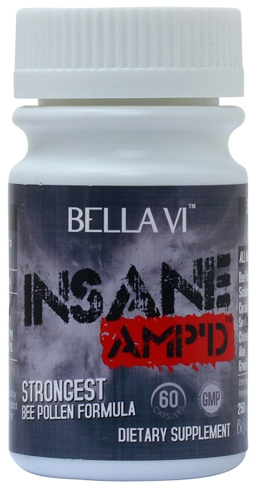 INSANE AMP’DTM is our exclusive All-In-One formula that provides necessary weight loss solutions. It’s formulated from a proprietary blend of specialized herbs designed to fire up the metabolism, suppress appetite and curb sugar cravings, detoxify the body, boost energy levels, enhance concentration and alertness and accelerate fat loss. With INSANE AMP’DTM it’s not necessary to change your diet, restrict foods or begin to exercise in order to lose weight. Don’t change your current eating and/or exercise habits. This powerful combination of natural plants will control the intake of extra calories and burn fat continuously. You will lose weight safely without the use of dangerous chemicals, stimulants and/or additives. The first few weeks you will notice more trips to the restroom. This will pass as your body’s metabolism is reset. There is still time before the summer. Check it out…it may be the right product for you!